An exhibition of stunning tree images by Goodwood heir the Earl of March will be shown in St Petersburg next year. The urban, treeless landscape of London’s Bermondsey and its garageland art galleries seem a long way from St Petersburg and its Marble Palace, a magnificent 18th-century neoclassical house commissioned by Catherine the Great from the Italian architect Antonio Rinaldi for her paramour Count Grigory Orlov. This, though, is the opulent setting for the latest showing of Nature Translated, the first art show to be held in Russia as part of the UK-Russia Year of Culture 2014. “Charles has found a way of using a small digital camera like a brush,” Edward Lucie-Smith, curator of Nature Translated, told me when this exhibition of photographs by Charles March first opened in May 2012 at the Bermondsey Project Space in south-east London. Lord March was a stills photographer on Stanley Kubrick’s 1975 movie Barry Lyndon and worked with leading advertising agencies in the Eighties. 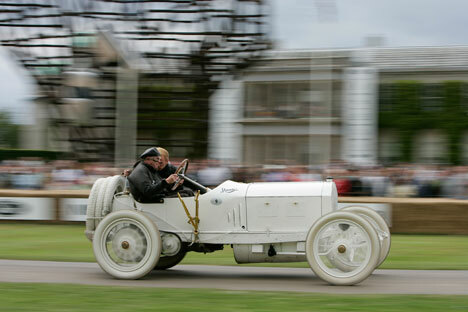 In the Nineties, he set up the popular Festival of Speed and the Goodwood Revival. Bermondsey is just a few minutes’ walk from Deptford where, in 1698, Peter the Great came to work in Thames-side shipyards to study how to build warships as effective as those of the Royal Navy. Peter helped create a channel between the Russian court and nobility and the best of British. Eighty years later, Catherine the Great hired a British architect, Charles Cameron, to work for her at her palace Tsarskoye Selo, where he created an English landscape garden in the style of Capability Brown. Nature Translated comprises unexpected yet beautiful shots of trees taken by March for the most part at Goodwood, the rolling West Sussex estate he has run, as Earl of March and Kinrara, since the early Nineties.“I’ve been taking photos of trees at Goodwood since I was 12,” he told me. Leaving Eton“rather hastily” at 16 – “we didn’t much like each other” – the then Charles Settrington worked as a stills photographer for Stanley Kubrick during the filming of Barry Lyndon, a picaresque tale of an 18th–century Irish gambler and soldier of fortune. After a stint as a reportage photographer in East Africa, he worked in the Eighties with leading advertising agencies including Saatchi & Saatchi and JWT for clients including Laura Ashley, Levi’s and Silk Cut. In time, duty called Settrington back to Goodwood, where, as Charles March, he set up the popular Festival of Speed in 1993 and, five years later, the Goodwood Revival. These sibling motorsport events are curated with the obsessive eye of a set designer, or photographer. When March first showed me his “Nature” photographs, the initial comparisons that raced to mind were the electrifying paintings of the Italian Futurists Umberto Boccioni and Giacomo Balla. Obsessed by movement and speed, these artists – working at peak revs just before the First World War – conjured dazzling oils that appeared to accelerate the world around them into a blurred frenzy. Balla’s Abstract Speed of 1913 and his Vortex of the following year were brilliant, vivid evocations of furious movement, while Boccioni’s series, States of Mind: Those Who Leave, painted at the same time, could be – you barely need to squint – forest scenes by March. A racing car, thundered Filippo Marinetti in his Futurist Manifesto of 1909, is “more beautiful than the Winged Victory of Samothrace”, and, said Marinetti again, in his New Ethical Religion of Speed, “great speed is prayer”. He did. Shake the camera, that is, as he pressed the shutter. It is this moving and shaking that has animated the trees in his pictures. A Russian friend of Lucie-Smith’s recommended Nature Translated to Alexander Borovksy, head of the department of contemporary art at the Russian State Museum, housed in St Petersburg’s Marble Palace. From 1937 to 1992, it was the Museum of Vladimir Lenin, who spent some years in London and had a decidedly non-proletarian passion for Rolls-Royce cars. Borovsky was fascinated by the fact that both March and the Russian Constructivist artist, Alexander Rodchenko, photographed trees in novel ways, although the Russian’s beloved pines are very unlike the cedars and oaks of Goodwood. A creative fusion of both new and veteran technologies – including digital cameras, computers, handmade English paper and inkjet printing – Nature Translated represents March’s mind’s eye. A man who loves the sights and sounds of blood–red V12 Ferraris screaming their Futurist way around Goodwood, he is rarely happier than when walking in the woods, where the loudest sound is the flutter of birds’ wings, the rustle of leaves and the click of a digital shutter. And, curiously, Nature Translated brings together a fascinating history of connections between Russian and British sensibilities, and especially perhaps of a Russian love affair with aristocratic England, its country houses and parkland estates. Even Russia’s revolutionary leaders were not immune to these charms, and since the collapse of the Soviet Union, rich Russians seem to desire blue-blooded British culture and property all the more. Nature Translated is a reminder that art from the world of the English country estate has yet to exhaust itself; seen through the lens of Charles March, and newly shown in Russia, it might be said to be undergoing a revolution of its own. 1. In 1570, Ivan the Terrible proposes marriage to Elizabeth I; he’s turned down, but trade between England and Russia is strengthened. 2. Britain sides with Russia in the First World War; heads of state, George V and Nicholas II, are first cousins. 3. In 1779, Catherine the Great employs London-born architect Charles Cameron. He becomes her favourite designer. 4. In 1917, Lenin seizes power in St Petersburg. He is soon being chauffeured in a Rolls-Royce, a make of car assembled on the edge of the Goodwood Estate today. 5. In 2005, St Petersburg-born Leon Max, the fashion entrepreneur, buys Easton Neston, the superb Northamptonshire house. 6. In 2009, Yekaterina Vyazova publishes The Hypnosis of Anglomania, a study of English influence on Russian art and culture of the 19th and 20th centuries. 7. 2014: Nature Translated opens at the Marble Palace in St Petersburg.